Pricing will be displayed on our website when you fill out the form below and click Get Pricing Now. Advantage cooling towers are simple to operate and utilize energy efficient evaporative cooling. 5°F to 10°F above the ambient wet bulb conditions. Warm water returning from the process is evenly distributed over the wet desk. Counter airflow driven by the fan causes a portion of the warm process water to evaporate cooling the remaining water. 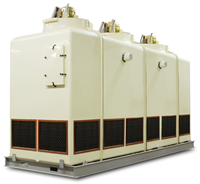 Advantage offers cooling towers in capacities from 45 to 540 tons in single and expanded cell systems. To Tower : 2 @ 6"
From Tower : 2 @ 10"
2. Cooling water from 95°F to 85°F at 3 gpm per ton and 78°F web bulb temperature. 5. When used with remote sump consult factory for connection size when the base of the tower will be used as the reservoir. 6. See Product Warranty Statement W-700 for details on warranty. Image is typical. Actual unit appearance will vary according to specifications and options. Our Experienced Team Can Save You Time & Money. Privacy Statement: we will not sell, rent or release any personal information you share with us to third party vendors. Product innovation and improvement is our constant goal. All features, specifications and pricing are subject to change without notice or liability.